Or rather A.G.A. (Against Guffaw’s Advice)! A while back, my friend Borepatch (who definitely has a right to such opinions in such matters) wrote regarding the acquiring and use of Siri, Google Now, Cortana or Alexa. I warned my roommate of such folly. BUT, she is addicted to newfangled gadgets (as best she can afford them)! There’s a cartoon somewhere (unfortunately, I couldn’t find it) showing government agents discussing how citizens will place wiretaps/bugging devices in their own homes voluntarily, and will allow them to record conversations and Internet activity with ease! Remember? From Steve Martin’s “The Jerk”? My roomie has me on her cellular account, and loves new technology. Fortunately (for us), the company with whom she contracts allows us to change or upgrade our phones up to three times a year! At no additional cost! To be fair, I was perfectly happy with my Samsung Galaxy Note 5 (although, I rarely used the note part, many times I cannot read my own writing!) But I’m certain it was clogged with unneeded and damaging apps, slowing performance, affecting memory and battery life. At least that’s how I rationalized my decision! About an hour and a half later, we left, each with a new Samsung Galaxy S8+ phone! Of course, not unlike buying firearms, there was an additional charge for the ‘+’ part, as well as the new protective covers! (J gets hers largely for style; mine so I won’t drop the slick S.O.B.!) These new phones are never the same dimensions as the old – smart marketing on their part. Thankfully, it wasn’t much. We don’t have much. How great is modern technology? In a span of less than 20 minutes, the rep placed our old phones adjacent to the new, activated a procedure, and transferred all our telephone contacts, applications, photos, privacy settings etc. to the new phones! Now if I can just learn all the new features before she wants another upgrade. Truly, another First World problem! Dave the mechanic and I were ‘window shopping’ (both being young and relatively poor, there was no way either of us could afford to purchase a firearm). And we were checking out all the related gear, as well (hunting, fishing, camping), just because. And there is was, a Jimmy Stewart Game Caller! We re-visited Don’s two or three times a year, for many following years, always recharging our memories and chuckles regarding Jimmy’s Game Caller. During one subsequent visit, we spotted it again on the shelf, and determined that the product was actually named the JOHNNY Stewart game caller! As it had been printed in a script font – and we were young and not paying much attention, anyway – we hadn’t noticed the difference! This failed to stop us from continuing our poor imitations of Jimmy for a number of years. Boys just gotta have fun! 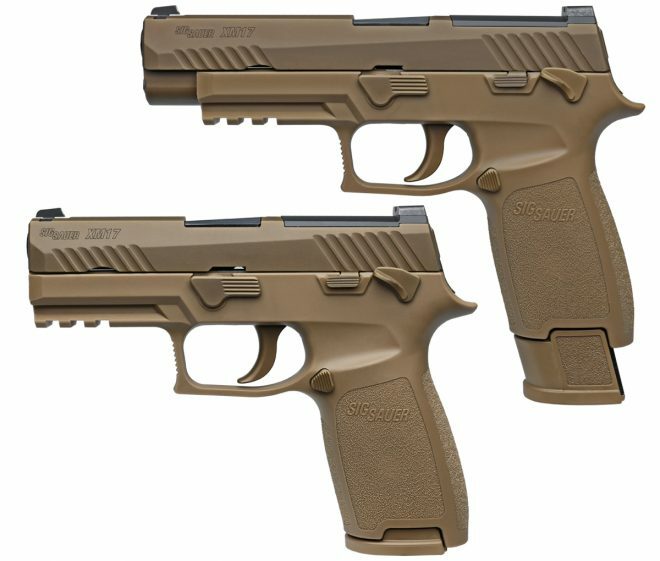 The US Army’s M17 Modular Handgun System, derived from the SIG P320 handgun, has crossed one of the final hurdles on the track to full replacement of previous service handguns (including chiefly the Beretta M9). The United States Navy, Marine Corps, and Air Force have all announced their acceptance of the M17 MHS as the new sidearm for each respective service, according to a story written by Matthew Cox for KitUp! The Modular Handgun System competition was decided with an announcement in late January that SIG Sauer had beaten out FN, Glock, and Beretta for the massive $500 million dollar contract for future 21st Century US Army sidearms. A protest on the decision from Glock is still pending a Government Accounting Office (GAO) ruling, which is expected by early June. The M17 MHS is a derivative of the SIG Sauer P320 handgun which sports interchangeable grip modules, suppressor support via a threaded barrel, interchangeable slide lengths on a single frame, and an integral optics mounting plate. Departing from the complex double action/single action hammer fired mechanism of the previous M9 pistol, the M17 Modular Handgun System utilizes a much simpler and cheaper striker fired design pioneered by the famous Glock family of handguns and utilized by SIG starting with the P320. Has a sidearm ever been accepted by the DOD, only to be rejected by the individual services? (SpecOps aside). This Is NONE Of Your Falcon Business!! I was reminded of the book The Falcon and the Snowman, wherein a spy was caught (according to the official FBI story) by someone determining the suspect liked falconry (hence his clever nickname), so agents lay-in-wait for him in Coos Bay, Oregon (a big falconry place), and captured him! Truth was (as is so often the case), is one of his friends gave him up! 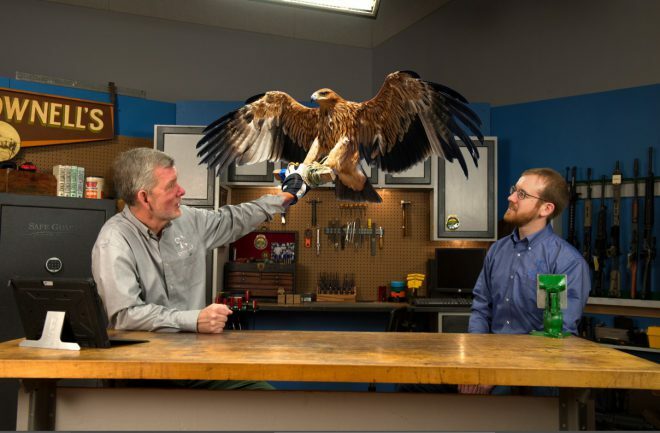 Brownells, known for its incredible selection of firearms and firearm accessories, proudly announced today it has become the internet’s largest tactical falconry dealer. Brownells’ new Birds of Prey product line features hundreds of items dedicated to enabling private citizens, law enforcement officers and military personnel to engage in the ancient art of falconry for the purposes of self-defense, hunting and homeland protection. The new line features well-trained tactical birds ranging in size from the sub-sub-compact Black-Legged Falconet up to the full-size Steller’s Sea Eagle – an offensive raptor designed for maritime operations. For customers in arctic conditions, the Birds of Prey line offers Gyrfalcons in traditional Snowy Tundra camo as well as a special Ghostly White Limited Edition, exclusive to Brownells. Also available are a full line of tactical bird accessories, gear and supplies. Some of the newest tactical falconry products in the line come from the innovative company Critical OperRaptor Dynamics™. Miniature Adhesive Falcon OperRaptor Beards are available in several colors and sizes and are guaranteed to resist bloodstains and not jettison during flight. Yes, this an April Fools joke. No falcons were harmed in this ridiculous hijinks. Actually, we’ve never even seen a real falcon. FALC! Wouldn’t that have been cool?! 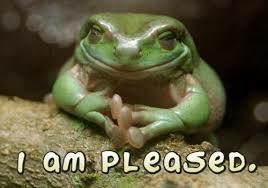 …or pray, if that’s what you do. Judy, my roommate, dear friend, and exgf, goes in for shoulder surgery this morning @ 0800. She is having a badly torn rotator cuff repaired. It seems 30+ years of doing hair has taken it’s toll! Thanks to everyone’s generosity, she has a number of things to make her recovery a little less painful. The lift chair, which is normally my domain in the living room, needed it’s controller replaced. Having use of one arm means she now needs it, at least temporarily. The surgeon wants her to sleep in it. And an ice jacket, which is placed over the shoulder with circulating ice water, will hopefully lessen her pain. We would not have been able to afford either of these things without your kind help. Well, off to the hospital! PS – Judy was very moved by your comments and emails, and thanks you! PPS – She made it through the surgery quite well (we have pictures!). A prognosis is for a complete recovery! Glock is protesting the military’s decision to replace its current sidearm with the relatively new SIG P320-based XM17. The military selected the SIG design to replace the aging Beretta M9 series pistols in service late last year. The protest, filed with the U.S. Government Accountability Office, needs a response from the U.S. Army Materiel Command by June 5th of 2017. Until the Army responds to the protest the switch from Beretta pistols to SIG pistols will not move forward. Time will tell if this is a business formality or if it will alter the course of the Army’s hunt for their next sidearm. Last I knew, Glock didn’t have any U.S. production facilities (?) Kinda a deal breaker if they somehow ultimately win this p***ing contest. I like Glocks. I like Sigs. The general consensus amongst gun folks (based on my tiny, unscientific sample) is that either one would be sufficient. Time, or rather the DOD, will tell!